This publication is the result of cooperation between the World Bank and the International Federation of Surveyors (FIG) over recent years to address the issue of building and sustaining land administration systems that are basically fit-for-purpose rather than blindly complying with top-end technological solutions and rigid regulations for accuracy. The cooperation started by the joint FIG / World Bank conference in 2009 addressing “Land Governance in Support of the Millennium Development Goals”. A report from this conference can be found as FIG Publication No. 45 (FIG/WB, 2010). concerns were subsequently addressed at several special seminars and workshops covering these issues including that of “Spatially Enabling Governments and Societies for Sustainable Land Administration and Management”. should be designed to meet the needs of people and their relationship to land, to support security of tenure for all and to sustainably manage land use and natural resources. This perspective calls for a flexible and pragmatic approach rather than requirements imposed through rigid regulations, demands for spatial accuracy and systems that may be unsustainable for less developed countries dependent on donor funding. Of course, such flexibility allows for land administration systems to be incrementally improved over time, should it be found necessary. This publication provides guidelines for the building of such fit-for-purpose land administration systems. The publication presents an innovative, flexible approach that is jointly endorsed by the World Bank and the International Federation of Surveyors. We would like to acknowledge the efforts of the authors in providing this publication. It is our hope that the fit-for-purpose approach will be widely applied throughout the world and especially in less developed countries seeking to address issues such as poverty alleviation, insecure access to land, inadequate shelter, social inequity and environmental degradation. Land administration should be designed to meet the needs of people and their relationship to land, to support security of tenure for all and to sustainably manage land use and natural resources. However, the current solutions to delivering land administration services have very limited global outreach; 75 percent of the world’s population do not have access to formal systems to register and safeguard their land rights. The majority of these are the poor and the most vulnerable in society. There is an urgent need to build affordable and sustainable systems to identify the way land is occupied and used. FIG and the World Bank have been cooperating on solutions to this global issue since 2009 and this fit-for-purpose approach to land administration has emerged as a game changer. Fit-for-purpose means that the land administration systems – and especially the underlying spatial framework of large scale mapping – should be designed for the purpose of managing current land issues within a specific country or region – rather than simply following more advanced technical standards. The fit-for-purpose approach is participatory and inclusive – it is fundamentally a human rights approach. Benefits relate to the opportunity of building appropriate land administration systems within a relatively short time and for relatively low and affordable costs. The fit-for-purpose approach being proposed here offers governments and land professionals the opportunity to make a significant improvement in global land issues. It is a realistic approach that is scalable and could make a significant difference in the intermediate timeframe. The cases provided in this report highlight just how successful this approach can be. Inclusive in scope to cover all tenure and all land. Participatory in approach to data capture and use to ensure community support. Affordable for the government to establish and operate, and for society to use. Reliable in terms of information that is authoritative and up-to-date. in response to social and legal needs and emerging economic opportunities. A country’s legal and institutional framework must be revised to apply the elements of the fit-for-purpose approach. This means that the fit-for-purpose approach must be enshrined in law, it must still be implemented within a robust land governance framework, and the information must be made accessible to all users. General boundaries rather than fixed boundaries. Using general boundaries to delineate land areas will be sufficient for most land administration purposes especially in rural and semi-urban areas. In the present context, the term “general boundary” means one whose position has not been precisely determined, although usually, the delineation will relate to physical features in the field. Aerial imageries rather than field surveys. The use of high resolution satellite/ aerial imagery is sufficient for most land administration purposes. This approach is three to five times cheaper than field surveys. Accuracy relates to the purpose rather than technical standards. Accuracy of the land information should be understood as a relative issue related to the use of this information. Opportunities for updating, upgrading and improvement. Building the spatial framework should be seen in a perspective of opportunities for on-going updating, sporadic upgrading, and incremental improvement whenever relevant or necessary for fulfilling land policy aims and objectives. Ensuring advocacy for change and providing support to change management is a key role for organisations like the World Bank, UN-FAO, UN-HABITAT, FIG and other land related professional bodies. The politicians and decision makers in the land sector are key players in this change process. The hearts and minds of land professionals need to be turned to fully understand and embrace the fit-for-purpose approach. Organisations in the land sector need to ensure the awareness and up-to-date skills of their members and staff. The largest change will be focused on the public sector where this may involve institutional and organisational reforms, including legal framework, processes and procedures, and awareness in terms of incentives and accountability. To drive this change process there must be effective knowledge-sharing to ensure the lessons learnt and good practices are widely implemented. 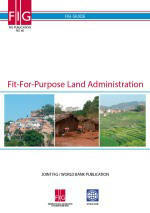 It is hoped that this publication will pave the way forward towards implementing sustainable and affordable land administration systems enabling security of tenure for all and effective management of land use and natural resources. This, in turn, will enable political aims such as economic growth, social equity and environmental sustainability to be better supported, pursued and achieved. Front cover: Left: Front cover photos left: Rio de Janeiro, Brazil; mid: Ghana; right: Nepal.